SayChiizu Manila Opens In MOA! To All Cheese Lovers: This Rainbow Toast Is In MOA! Don't forget to capture that cheese pull. Everything I love about food goes back to the beauty of mukbangs, especially when they eat anything with cheese. Mukbangers *know* that viewers live for that cheese pull, which usually ends up as the main image of every video. 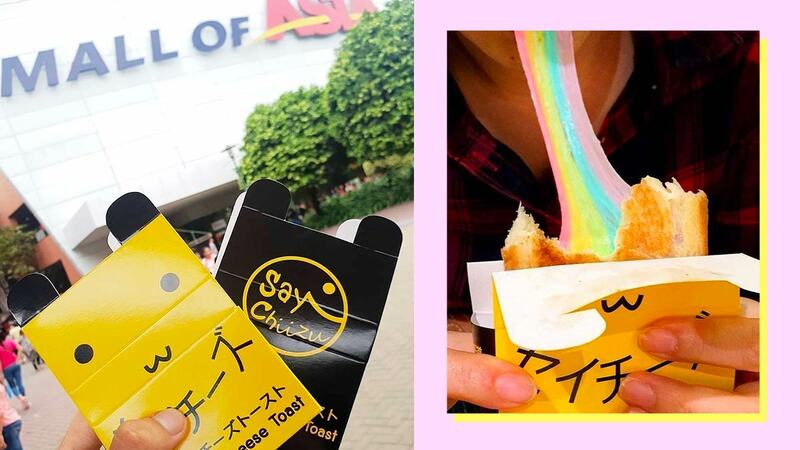 Turns out, this Unicorn/Rainbow Toast is from SayChiizu Manila! This colorful treat is made up of five different fruit flavors: green apple, banana, strawberry, blueberry, and mixberry. SayChiizu opened its first branch in the country on November 30 2018, and it's located in MOA. Though everyone is already loving the Unicorn Toast, SayChiizu is actually known for their signature Hokkaido Cheese Toast, with mozzarella being at the center of this creation. Tip: Wait two minutes before that first pull.